Robin Givhan's comparison of Michelle Obama to Claire Huxtable is far from new, but it is newly bizarre, implying that six months into the Obama administration, Americans still need a dated TV show to understand Michelle. Michelle Obama: The Best Black Female Role Model Since Claire Huxtable? Time and again, observers grasp for adjectives to describe Obama's combination of professional accomplishment and soccer-mom maternalism. It's no wonder so many eye her with awe and disbelief. Or why a minority still view her with suspicion. And the reason? "There have been few broad cultural precedents for what she represents." Translation: we haven't seen enough characters like Michelle on TV! The exception is Claire Huxtable, "a cultural comparison more apt than the one made to Jackie Kennedy" (Jackie: real but white. Claire: fake but black. Advantage: apparently Claire). Givhan writes that "television, in particular, speaks to viewers intimately, in the privacy of their homes, building long-term relationships and weaving complicated narratives." Know what else speaks to people in the privacy of their homes, building long-term relationships and weaving complicated narratives? Human beings. It's true that America is still highly segregated country, and that many non-black people don't live in areas with a thriving black middle class (in Iowa, for instance, black people make up 2.6% of the population and own just 0.7% of businesses). Givhan quotes Cosby Show writer Susan Fales-Hill, who says, "There's a generation with very little exposure to the black professional class, and they stand in amazement. [...] People say, 'You're so articulate.' And it's because I can string a sentence together!" Fales-Hill's experience is in line with many things people said about Obamas on the campaign trail, but Givhan's take on that experience is troubling. Through her description of the power of television ("TV builds kinship") and her vague analysis of the American psyche ("what [people] do not see on a regular basis, they assume to be rare or even nonexistent"), she implies that it is television's responsibility to prepare us for successful black women like Michelle Obama. This is offensive to black people (invisible unless they're on TV), white people (too dumb to know anything but what they see on TV) and television (not an art form, but rather an educational medium for dumb people). Rather than tackling the social and economic reasons why people might still be uncomfortable with Michelle (racism? Large-scale segregation in cities? Lack of education about other successful black Americans? ), Givhan weirdly turns to an outdated fictional comparison, and then wonders why there aren't more outdated fictional comparison to turn to. I keep saying this: Michelle, Barack, and my son are not abnormal [...] All my relatives, all my friends, all their friends, all their parents, almost all of them have the same story. It's just that their families aren't running for president. It bothers me that people see [Michelle and Barack] as so phenomenal, because there's so much of that in the black neighborhood. They went to the same schools we all did. They went through the same struggles. offer a deeper understanding of African American life, a greater appreciation of the bourgeois ordinariness of our experience. "People have never met a Michelle Obama," the soon-to-be first lady said toward the end of our interview. "But what they'll come to learn is that there are thousands and thousands of Michelle and Barack Obamas across America. You just don't live next door to them, or there isn't a TV show about them." Even if white people once needed to think of Claire Huxtable in order to understand Michelle Obama, the Obamas have been in the White House almost six months now. Michelle Obama is regularly on television, and Claire Huxtable is not. Why would we compare Michelle Obama to a TV character when, as Coates points out, she has her own show now? Of course, this show is also real, like the lives of millions of black middle-class people who existed before the Huxtables, and will continue to exist after them. 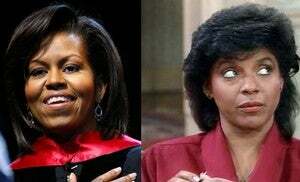 Earlier: Michelle Obama: The Best Black Female Role Model Since Claire Huxtable?